Trails aren't all singletrack and obstacles. Trail races are called challenges for a reason—they’re not easy. The mileage? No problem. It’s the winding route, the downhills on uneven surfaces, the hopping over logs and whatever else one can encounter on a trail that can make a five-mile route challenging. But those aren’t to be taken as turn-offs but turn-ons. Yesterday I ran my first trail race, the Universal Sole Trail Challenge Fall Edition. I rarely worry about surviving a run, especially one that’s five miles, unless I’m coming back from an injury or said run is a speedy track workout, but I was nervous about this one (not a lot but enough to elicit a “what have I gotten myself into after picking up my packet?”). I shuddered at running singletrack—mostly because I’m usually riding the ruts, and wobbling, and this first foray into the forest would be amid a crowd. I’m OK with trail testing on my own—I pushed the pace in Colorado Springs’ Red Rock Canyon last month—but not with others watching, especially if, when, I lose my footing. It didn’t help that we almost missed the race start, thanks to a combination of heading out the door behind schedule (note to self: pack trail gear the night before) and hitting a traffic pile-up on the way there, or that I was testing out a pair of trail racers. But I underestimated my abilities and the trail. Trail racing is F-U-N. The 5.25 miles sped by way faster than any Lakefront run—even though I couldn’t run as fast. The course twisted and turned through Schiller Woods, around trees, over fallen logs (yeah, I need to get better at climbing those so two guys don’t whisk by me next time), up quad-burning hills, into mud, across mounds of leaves and down some semi-scary descents (I blame the leaves for giving me tender feet). Yeah, not an easy course though it was well marked and scenic. Lessons for next time: keeping my momentum through the trail’s twists and ignore the vociferous runner who didn't seem satisfied with the course--who cares if the route didn't match the map? And there will be a next time—I was sorry I had never run these woods before or other USole trail races. What was I thinking? And all those fears? Completely unnecessary. The trail racers were the perfect shoe choice (more on those in a future post). The water stop was perfectly positioned—I needed water like I needed to catch my breath, and I didn’t want to carry a hydration pack with me. The race was the best way to try trail running—I never would have done it on my own. And this one in particular got a nod in my book for not breaking the bank ($35 when some 5Ks and 10Ks top $40), featuring a sharp T-shirt and FuelBelt bottle as takeaways, having parking steps from the start line and a traffic pattern that didn’t create a 15-minute back-up (we would have been late otherwise), not having a huge crowd (I forgot how fun it is to run a race that doesn’t have more than 1,000 runners in attendance), offering a raffle, emceeing by USole's owner Joel Feinberg that was educating and entertaining (he shared some interesting facts about some of the racers), and providing chili at the finish line. Well, you’d find beer, Muscle Milk, coconut water, Clif Bars and fruit snacks, too, but the homemade chili, courtesy of USole’s own Will Bridge, was just what my tummy needed to warm me up. Delish! I’m ready for my next trail race—as long as they can all live up to this one--and with one stipulation. Can I have a thermos of Will Bridge’s chili waiting for me at the finish line? I could get used to that as post-race fuel, especially after sweating through the closest I'll ever come to running the steeplechase. For more information about the Trail Challenge, check out these race photos, the race results, and the details page. Photo grabbed from Universal Sole at flickr. So happy you enjoyed it! I ran it too and had a blast. 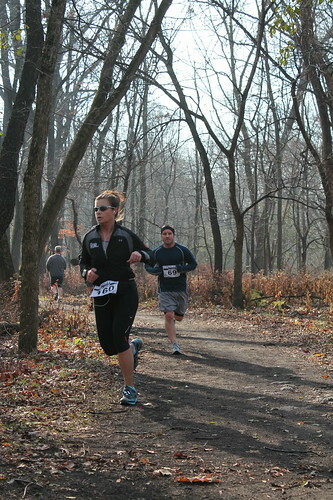 Will you be back at Shiller Woods for the Schiller Chiller on 12/1? Sorry about the delay, been traveling for turkey day. I LOVE the pictures you took from the race, especially the log hopping and the downhill part at the start (looks so much worse than it felt while running). I wish I could run the Schiller Chiller, but it was already full. But that's OK, I'm going to be out of town and found an Ugly Christmas Sweater 5K that I think I'm going to run that morning.